You probably will never hear Drop My Knight mentioned in any “good games” talk, but it is a simple, addictive, and an oddly relaxing game. In Drop My Knight you fling you knight and watch him drop down and hit things; you get points based on how hard the hit was, and which body part hit. There’s no real skill needed, nor strategy, but it’s a great “chatting game”; you can play at you own place, and have to do very little. And in a very odd way it’s quite calming to watch the “knight” plummet to his death. 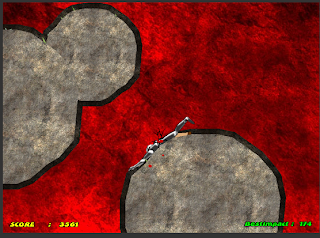 The game isn’t really gory, some blood effects, but it’s nothing shocking in the world of flash games. So Drop My Knight receives my Hidden Gem badge!